During Media Day we kept our eyes out for new multi-gun gear, since 3-Gun Competition is becoming so popular. At the Surefire booth we ran into 3-Gun Ace Barry Dueck (pronouned “Duke”). 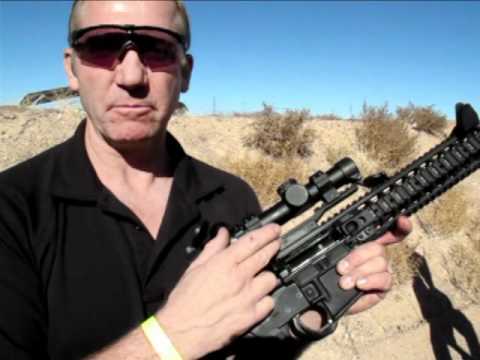 Barry demonstrated the side-mounted iron sights he produces for AR-type carbines (actually these sights can work on any rifle that has suitable rails). Running a combination of a magnified, 1-5X Leupold on top with iron sight mouted at a 45-degree angle on the sides, Dueck can rapidly transition from optics to irons. The top scope works great for longer shots, but Dueck finds he can engage close targets more quickly (and accurately) with the iron sights. While some other 3-gunners run a magnified optic on top and a red dot sight on the side, the use of two (2) glass optics puts a 3-gun competitor in a different division. Dueck’s Rapid Transition Sight (RTS) System, allows him to compete in the single-optics classes. The side-mounted irons are also more foolproof than any electronic sight, as Dueck explains in the video below. 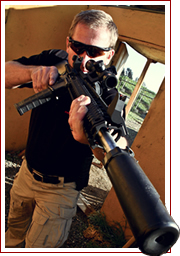 Share the post "Barry Dueck’s 3-Gun Sighting Solutions"